Central London Bed and Breakfast Hotel: Tourist Board 1 Diamond category. Super-clean, Super-comfortable and Super-affordable hotel! This great value hotel in Earls Court, Central London, is a family run hotel that has been in existence for four decades. The hotel is a beautiful Victorian building, situated only a minutes walk from Earls Court tube on the District Line. The hotel offers rooms with both ensuite or shared facilities (at lower rates). A breakfast of toast, jam, eggs, cereals and fruit juices along with tea and coffee is included in the rates. TVs are available free of charge on request. You can also take advantage of the guests kitchen where you can prepare your own meals if you wish. For guests with cars there is a car park nearby. 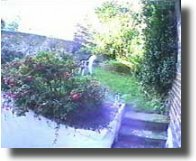 The hotel also has the benefit of its own garden which guests are welcome to use. A friendly and pleasant atmosphere and a reputation for cleanliness has ensured the hotel listings in the English Tourist Board Where to Stay in England guides and in very many other worldwide circulated guide books. At this great value hotel in Earls Court, all rooms are spacious and comfortable and kept clean at all times. Whats more, we have a fully equipped kitchen for your use. You can prepare a meal or just a cup of tea. A sunny patio and large, serene garden is here for your relaxation after a hard days shopping or sightseeing. Many of the rooms have brand new showers. - Singles, double, twins and families with children welcome! - Our family rooms are great value - 3, 4 or 5 beds! - Free use of hotel kitchen for preparing own lunches/teas/dinners. - Sunny, safe garden patio. - Less than a minute's walk from Earls Court Underground station. - A short, pleasant walk to Kensington High Street, where the best shops and bargains are. 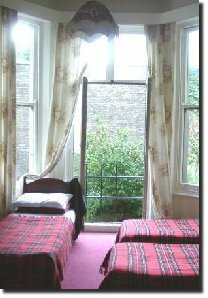 - All you need for a comfortable, friendly and inexpensive stay in London! Feel at home - away from home. The Windsor House Hotel looks forward to welcoming you - soon!